Continuing with our last delivery, and following the cinematic parallelism, that year we fulfilled the par one of the dreams of every traveler who cares: a safari in the heart of wild Africa. In swahili, “safari” means “great journey”. And we all had that … and as none of those present “had a farm in Africa” (in the words of Baroness Blixen, of that splendid 1985 film), we decided to make an unforgettable exploration trip to the land of “the plains Without end “of the masai. Continuing the magnificent experience of ascension to the iconic Kilimanjaro (Stratovolcano of 5.895 m), part of the expeditionaries ventured into the lands of the Northern Safari (An environment composed of several parks and nature reserves declared World Heritage by Unesco) to be witnesses in first person of one of the summit works of nature. From Arusha we drive in the off-road to Manyara Lake, for E. Hemingway “the most beautiful lake in Africa” (Green Hills of Africa). With the stunning Great Rift Valley as a backdrop, we would enjoy an idyllic sunset cruise in this paradise of migratory birds, dotted with baobabs and acacias where, among other species of large mammals, the slippery leopard lives. Going through Olduvai Gorge (“The cradle of humanity” for anthropologists), we would visit the incomparable Serengueti (15,000 km2), famous for the ancient annual migrations of thousands of ñues and for being the home of an extraordinary and rich fauna, which includes thousands of copies of the ” Big five “: lion, leopard, elephant, black rhinoceros and buffalo cafre. 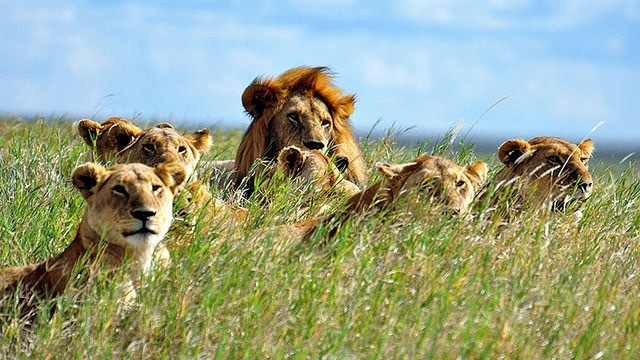 After camping on the very edge of the crater Ngorongoro, under the starry sky of the savannah, we would enter the stage of one of the largest concentrations (about 25,000) of large mammals of the planet, emphasizing the colony of great predators as well as the huge flocks of pink flamingos. As if that were not enough, and already “off the beaten track”, some of the chosen ones will finish this indescribable tour with a few days of diving in the color explosion of the still and crystalline waters of the neighboring archipelago of Zanzibar.